I have this wonderful friend who went nuts planting strawberries this year. After putting in her 150th plant, she said NO MORE and called me. Did I want about 25 strawberry plants she asks. Do I say tell me about them? Do I say what kind of strawberries? Do I even ask if they are everbearing? Nope I just said yes I want 25 strawberry plants. I just happen to have netting I can use to protect the berries from birds. What I am wondering tho.........should I just make a bed for them and pop them in the ground or would a raised bed do better? 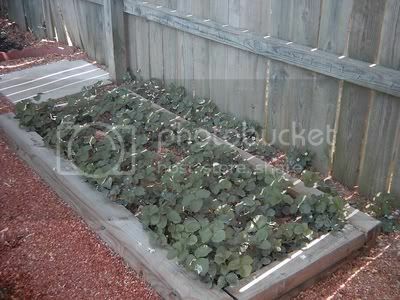 I know for harvesting, I would rather have the raised bed but I don't know if that would be better for the strawberries. Do I put them in full sun or do I want to protect them a bit? See what I usually do is buy strawberries, I have never grown them before. all I had to do was LOOK after all. I grow mine in a hanging basket.I have plans for a wooden pillar with holes in the side to grow the plants out of.Weezie has some.I belive either her or her mom have the lil circle thinggy done in stacks. When they get finished blooming they will grow a runner and will make another plant.you can tuck that in soil and will root out and will have an addidonal plant for next year.I use a time release fertilizer with mine thats for veggies.I could tell ya the ratio,if had not finished box.I bought at walmart says veggie fertilizer about Bisquix sized box for $1.19 is good for 3 months.is like a cheaper version of osmote(even the same color),but states for veggies. I grow a everbearing.It usually fruits till end of june.they also have varietis that are june bearing> I didn't get any cause thought would mark them down....and when they did,,,,,,they didn't mark down the June bearing ones....just the ever bearing& now they are out of June bearing.I think folks in cooler climates grow the june ones,but am not sure.But I killed the ones in ground& plus have dogs,a cat& ducks. I posted this before..it was earlier and I don't have an updated pic as of right now. But, I love my raised bed...and have been pickin berries for 2 weeks! I did have to put the birding net over it ....and just a note...they WILL crawl under the net id the bottom is not secured to the bed! Happiness, like a dessert so sweet.